What would cause sudden weight gain and increased appetite in a guinea pig? I've just taken an adult male guinea pig (exact age unknown) into the rescue who has gained a lot of weight at the shelter in the last couple of weeks. Now we don't know how much weight gain as they have never weighed him, but he he has gotten very fat. He currently weighs 1374 grams. The woman at the shelter said he is eating everything in his food bowl every day, and his food dish there probably held about 3/4 to a cup of pellets. The do not get hay at the shelter. Obviously this was an increase from what he was eating before or she wouldn't have mentioned it. He has been at the shelter since July 24th. I'll have more information from his foster home within the coming days and he's seeing the vet this week or early next, but I wanted to get an idea of possibilities and maybe questions to ask the vet/diagnostics to have done when we go. 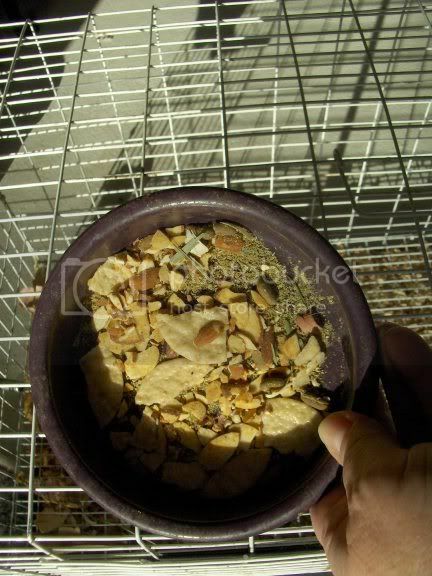 The pellets have lots of grains in them and may make him fat. Tell them to cut back on the pellets and offer unlimited hay. I would ease off until they're at 2 tablespoons of pellets a day and unlimited high quality hay. We've had several males pack on the weight after coming from a shelter. My best guess is that they're scared they'll never see food and pack in as much as they can as fast as they can. A couple have gotten so overweight as to feel bad, become sluggish, even a little depressed. Then, once they become comfortable and secure (and have adequate room for exercise), they begin to drop down to an appropriate weight on their own. Hay will definitely help. I read somewhere that a guinea pig's 'appestat' is connected to fullness (pressure) in their GI tract (vs. a carnivore's, which is linked to blood sugar levels). Hay will bulk up the GI tract and reduce (hopefully, anyway) overconsumption of pellets. My adopted Sandy Sweet Pea went from 1.12 1/2 lbs on March 15 (when I got her) to 2.4 lbs on April 6. That's a gain of 4 1/2 ounces in one month. She just voraciously ate after I took her in. She still eats romaine to this day as she were starving. She is now at 3 lbs 11 5/8 oz in the middle of August. Sandy says that she is not overeating, just finally eating WELL. Aww poor little pig, she's very pretty but does look a bit chubby. 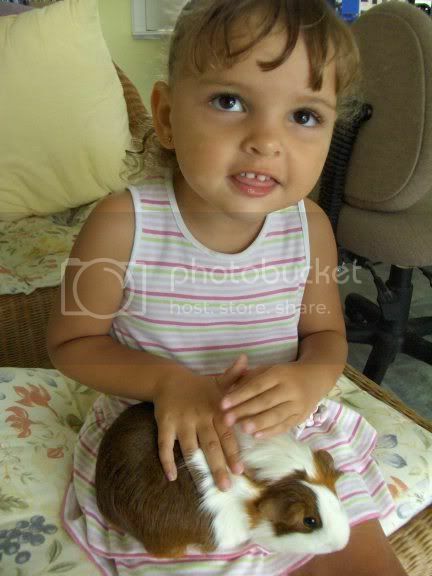 :) Who is the cutie holding her? 1 and a 1/2 hay racks since you brought him - so in 5 or 6 hours? A bowl of greens including a small baby carrot and 4 blueberries so far. Each bowl is 1 cup capacity, the hay rack is a typical one that you buy at the store, I guess it would hold a couple of cups of hay? The foster home has another little guy who apparently ate voraciously in the beginning, but seems to have learned that he doesn't have to worry about where his next meal is coming from and doesn't eat so quickly, so maybe that's going to happen with this guy too (his name is Timmy by the way). I'm sure his foster mom is reading this so she will take everyone's advice with regard to feeding adjustments and such. Many of mine have packed on enormous amounts of weight after they arrived here. The biggest gainer of all in a short time was Llewlyn, who gained almot 12 ounces in just a few short weeks. He lost that weight after his neuter a few months ago, and he's still a nice, big boy. I do think that previously poor conditions inspire them to eat when they come into rescue! I give each pig 1/4 cup pellets per day. Recently Marilyn has been emptying the bowl, but I don't fill it again until the next day. The only ones I refill are the cages where there are pigs who need to gain weight. They have to cut back on the pellets. Tell them no more than 1/4 cup and unlimited high quality hay. I took in a pig, cured him of mites and found him a new home. Months later the new owner contacted me and said I could go visit him and I did. He had gained so much weight she took him to the vet because she thought for sure he had a tumor. He also ate a tremendous amount of food. Well, he was x-rayed and there was no tumor. When I saw him I was shocked. He had gained half his body weight! I have never seen a guinea pig that big in person. The new owner is a biology teacher and we agreed that perhaps he was malnourished and underfed from where I rescued him. Did you ask what they were feeding him? At the shelter you mean Lynx? No, but I imagine it's some kind of bulk alfalfa pellet. No hay, infrequent veggies when one of the women brings some in. Can you get them to give hay and cut back on the pellets? It sounds like he needs a diet change badly. Oh yes, they're definitely going to be cutting back on the pellets, and of course he would always get as much hay as he can eat. In his foster home he's getting Cavy Cuisine too, not alfalfa pellets, so hopefully that in itself will be a big help. Today Timmy did great, only 2 hay racks of Timothy hay, a 1/4 cup of Timothy pellets, his greens breakfast and dinner. I went and checked on his mid day and he seems to be starting to save some of his greens for later. Hopefully he'll continue to improve. We had him out for floor time and he just sits there, so maybe that'll improve too once he doesn't spend all his time eating. Tomorrow I'll cut his pellets back again. I just wanted to update everyone on how Timmy is doing. Timmy came to us as a foster on September 10th and we instantly fell in love with him! We managed to tame his eating quite a bit and his weight is now stable at 1366 grams. We decided to make him a permanent part of our family and adopted him a couple of weeks later when we failed miserably at letting him be adopted out to someone else. Our home just wasn’t the same without him for a couple of days when Alice took him to be shown to a potential adopter. Since then he’s become very spoiled, was neutered the end of October and now has become good buddies with our female Stinker. He loves to snuggle, read with my kids and gives kisses. Put him on the floor for play time and he instantly becomes this big goofball. He still drags his ducky everywhere with him, though we’ve managed to limit it to the cage now. Alice, thanks for bringing Timmy into our lives, we couldn’t have asked for a better addition to our family. What a wonderful story. Thanks for the update, Kallie. Ahhhh... what a GREAT story! And such a handsome fella!
" He still drags his ducky everywhere with him," -- this is funny. I can't imagine a guinea pig doing this (though it sounds like he does! I think I spoke too soon about Timmy doing so well. We brought him in for his 3 week follow-up after his neuter. He&#8217;d been healthy all along, but the vet scraped off a tiny dried scab left of his healed incision. To our surprised, out oozed a bunch of yellowish thick puss. She managed to get most of it out, and he was put on Baytril for 10 days and we cleaned it out twice a day. No intolerance was shown at all to the AB. We brought him back for another follow-up on Monday and also mentioned he hadn&#8217;t been eating, drinking or pooping the way he was prior. His last dose of Baytril was Thursday morning, his eating changed on Saturday. The vet confirmed the infection was fully gone, and checked his teeth.. she found his molars to be slightly over grown. We decided to leave him over night at the clinic where he could be started on Cisapride(?) and hand fed until morning when his molars would be filed down. When he was under, the vet took the following images of Timmy&#8217;s mouth because she was totally shocked at what she found. Not only were his molars slightly over grown, but he had a wood chip lodged in his molars. The wood chip managed to lodge itself in such a way that it was constantly rubbing against his check and slightly stuck into the underside of his tongue. 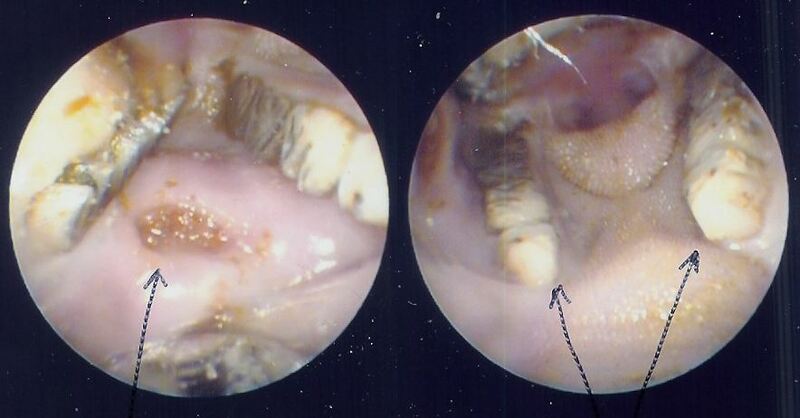 The left image shows the wood chip lodged in his teeth, against his cheek and tongue. Image two shows his over grown crowns. 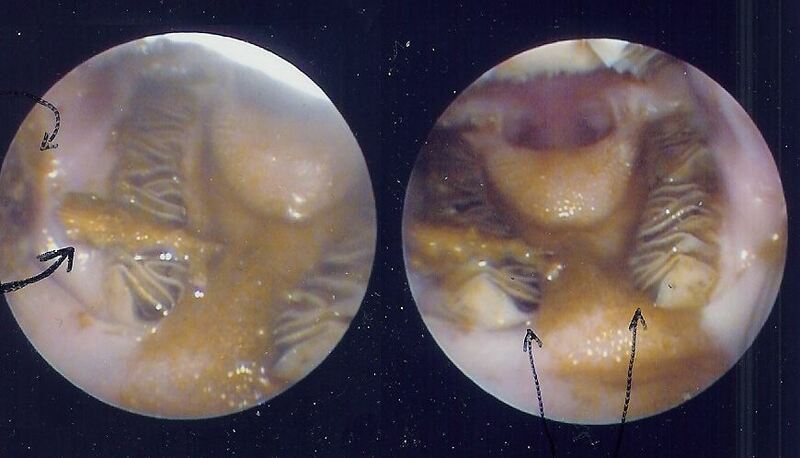 The left image shows the ulcer caused by the wood chip. Image two shows his new pearly white crowns. I&#8217;ve been hand feeding him both water and food, but is there anything else I can do to make him feeling more comfortable &#8211; other then the Metacam? He&#8217;s eating all of his soft greens, but still no carrot or hay.. and still hardly any water on his own. So it&#8217;s obvious he is still quite uncomfortable. How long can I expect it to take before he starts to eat hay and drink from either a bowl or water bottle again? What should I look for in the terms of any possible complications? How long do I keep him on the Metacam at 0.1cc once a day? If you have the standard suspension of Metacam that comes in a purple box, 1.5 mg/mL, I would bump him up to 0.2cc once a day, or even 0.15cc twice a day for a day or two. Does he still weigh over a kilo? I'm thinking 0.1cc once a day isn't enough Metacam to help him feel better, given what's happened with his poor mouth. I am so glad you have a good vet. You might also offer him some unflavored Pedialyte. Try it in a syringe first to see if he likes it; many of them do. If he does, you can put it, or a mixture of it and water, in his bottle. Wow, those images are kind of cool. Poor little pig though! I hope he gets to feeling better soon.